All you have to do is cast our little poppet as a literary character and tell their story in a 3- or 4-line poem. No, it doesn't have to rhyme. Yes, it can be a haiku. Yes, you can change the character up and surprise us. In fact, we encourage you to! Poppets aren't just sweet. They're also creepy and, most of all, surprising. 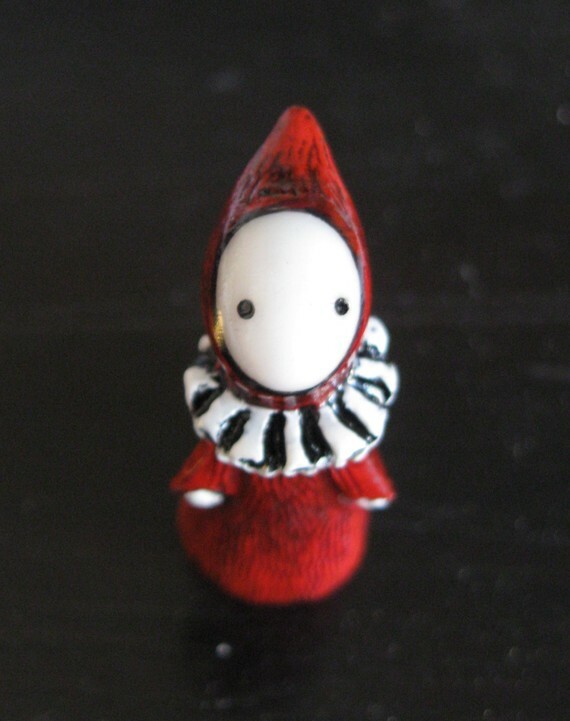 We'll use the most obvious character as our example: Little Red Riding Poppet. And no, you can't use her, too. You CAN use the same character someone else in the comments does. But remember: The judges are looking for originality as well as all the other poetical things, and the first use will earn more points for being the more original. Sweet upturned face quite fools the eye. Once she frees the ninja powers hiding 'neath her red, red cape. wiped away by witch's spell. But looks can kill, as heaven knows. She should have cursed my eyes as well. Peter, that's brilliant! And there's no way I can follow it. Aw, shucks, thanks! But please try! Everyone, let's see what you got! Don't leave the poor Poppet lonely! "My, that Robin, he's quite the tight rogue!" Um, Rob, I believe you want the Grisham contest next door. Hee! I just had fun - it came out silly andI kept it that way! But yeah, I enjoyed the hell out of the Grisham one. Little Miss Poppet, sat on her carpet; picking the lint away. Along came kitten in search of a mitten, and gnawed Poppet's dress to fray. Oh I loved all of these! I need more poetry in my life. And I wish I had more poppets to give away! I declare the winner to be: Peter Dudley with his cursed poppet poem. Peter, email me your postal address and I will send the poppet to you with airholes (peep holes?) in the envelope.